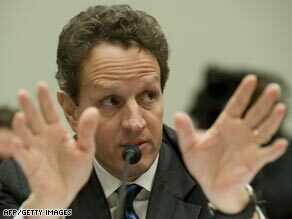 Is Geithner the man to fix the U.S. economy? (CNN) -- The Treasury Secretary of the United States always makes his mark on the economy: you can see his signature on the bottom corner of every dollar bill. This week's market rally on Wall Street is the first sign that Geithner may be moving in the right direction. In good times, that may be the only obvious imprint they leave behind. The job tends to be low-profile and largely overlooked. But Timothy Geithner is making his mark the hard way, as caretaker of the economy in the worst crisis since the Great Depression. He's emerged as the key figure in Barack Obama's cabinet, its chief economic spokesman and a target for controversy. This week, when the Dow Jones Industrial Average jumped dramatically, Geithner was given his first acknowledgement by the investment community that he may be on the right track. Geithner is a former senior official of the U.S. Federal Reserve. He's a slight, soft-spoken career civil servant with a tentative manner. He started his new job badly. The Treasury Secretary is America's chief tax collector and Geithner took the post after admitting to falling behind on his own taxes. More recently, his department made the administration's politically disastrous decision to allow millions in bonuses for executives of the failed financial giant AIG. President Obama expresses full confidence in Geithner, but Republicans have been calling for his resignation and Wall Street has been voting against him at almost every opportunity. The Dow had been dropping ever since Obama took office and dropped more almost every time Geithner came forward to talk about his economic plans. Lately, though, the market's been moving up and this week investors actually seemed to applaud the administration's new ideas about helping banks sell-off bad investments. The Dow jumped nearly 500 points in one day. That's good news for Americans, but it's not the news they want. Most voters are untrained in the complexities of economic policy. Geithner is playing a very serious game they don't understand, with a lot of money riding on the outcome. People are just waiting to see whether they'll start winning; winning back the savings, jobs and homes they've lost or fear losing.